I watched it get dark outside; the darkness came very quickly. It would be a black night with the rain. When it was dark there was no use watching any more, so I went over to Piani. He was lying asleep and I did not wake him but sat down beside him for a while. He was a big man and he slept heavily. After a while I woke him and we started. That was a very strange night. I do not know what I had expected, death perhaps and shooting in the dark and running, but nothing happened. We waited, lying flat beyond the ditch along the main road while a German battalion passed, then when they were gone we crossed the road and went on to the north. We were very close to Germans twice in the rain but they did not see us. 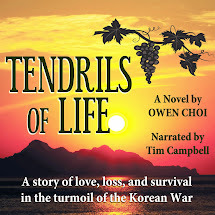 We got past the town to the north without seeing any Italians, then after a while came on the main channels of the retreat and walked all night toward the Tagliamento. I had not realized how gigantic the retreat was. The whole country was moving, as well as the army. We walked all night, making better time than the vehicles. My leg ached and I was tired but we made good time. It seemed so silly for Bonello to have decided to be taken prisoner. There was no danger. We had walked through two armies without incident. If Aymo had not been killed there would never have seemed to be any danger. No one had bothered us when we were in plain sight along the railway. The killing came suddenly and unreasonably. I wondered where Bonello was. "How do you feel, Tenente?" Piani asked. We were going along the side of a road crowded with vehicles and troops. "Well, all we have to do is walk now. We don't have to worry." "He was a fool all right." "What will you do about him, Tenente?" "Can't you just put him down as taken prisoner?" "You see if the war went on they would make bad trouble for his family." "The war won't go on," a soldier said. "We're going home. The war is over." 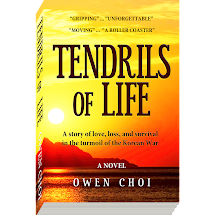 "Come on, Tenente," Piani said. He wanted to get past them. "Tenente? Who's a Tenente? A basso gli ufficiali! Down with the officers!" Piani took me by the arm. "I better call you by your name," he said. "They might try and make trouble. They've shot some officers." We worked up past them. "I won't make a report that will make trouble for his family." I went on with our conversation. "If the war is over it makes no difference," Piani said. "But I don't believe it's over. It's too good that it should be over." "We'll know pretty soon," I said. "I don't believe it's over. They all think it's over but I don't believe it." "Viva la Pace!" a soldier shouted out. "We're going home!" "It would be fine if we all went home," Piani said. "Wouldn't you like to go home?" "We'll never go. I don't think it's over." "Andiamo a casa!" a soldier shouted. "They throw away their rifles," Piani said. "They take them off and drop them down while they're marching. Then they shout." "They ought to keep their rifles." "They think if they throw away their rifles they can't make them fight." In the dark and the rain, making our way along the side of the road I could see that many of the troops still had their rifles. They stuck up above the capes. "What brigade are you?" an officer called out. "Brigata di Pace" some one shouted. "Peace Brigade!" The officer said nothing. "What does he say? What does the officer say?" "Down with the officer. Viva la Pace!" "Come on," Piani said. We passed two British ambulances, abandoned in the block of vehicles. "They're from Gorizia," Piani said. "I know the cars." "They got further than we did." "I wonder where the drivers are?" "The Germans have stopped outside Udine," I said. "These people will all get across the river." "Yes," Piani said. "That's why I think the war will go on." "The Germans could come on," I said. "I wonder why they don't come on." "I don't know. I don't know anything about this kind of war." "They have to wait for their transport I suppose." "I don't know," Piani said. Alone he was much gentler. When he was with the others he was a very rough talker. "You know I am married." "Is that why you did not want to be a prisoner?" "That is one reason. Are you married, Tenente?" "You can't tell anything by a man's being married. But I should think a married man would want to get back to his wife," I said. I would be glad to talk about wives. Before daylight we reached the bank of the Tagliamento and followed down along the flooded river to the bridge where all the traffic was crossing. "They ought to be able to hold at this river," Piani said. In the dark the flood looked high. The water swirled and it was wide. The wooden bridge was nearly three-quarters of a mile across, and the river, that usually ran in narrow channels in the wide stony bed far below the bridge, was close under the wooden planking. We went along the bank and then worked our way into the crowd that were crossing the bridge. Crossing slowly in the rain a few feet above the flood, pressed tight in the crowd, the box of an artillery caisson just ahead, I looked over the side and watched the river. Now that we could not go our own pace I felt very tired. There was no exhilaration in crossing the bridge. I wondered what it would be like if a plane bombed it in the daytime. "Here I am, Tenente." He was a little ahead in the jam. No one was talking. They were all trying to get across as soon as they could: thinking only of that. We were almost across. At the far end of the bridge there were officers and carabinieri standing on both sides flashing lights. I saw them silhouetted against the sky-line. As we came close to them I saw one of the officers point to a man in the column. A carabiniere went in after him and came out holding the man by the arm. He took him away from the road. We came almost opposite them. The officers were scrutinizing every one in the column, sometimes speaking to each other, going forward to flash a light in some one's face. They took some one else out just before we came opposite. I saw the man. He was a lieutenant-colonel. I saw the stars in the box on his sleeve as they flashed a light on him. His hair was gray and he was short and fat. The carabiniere pulled him in behind the line of officers. As we came opposite I saw one or two of them look at me. Then one pointed at me and spoke to a carabiniere. I saw the carabiniere start for me, come through the edge of the column toward me, then felt him take me by the collar. "What's the matter with you?" I said and hit him in the face. I saw his face under the hat, upturned mustaches and blood coming down his cheek. Another one dove in toward us. "What's the matter with you?" I said. He did not answer. He was watching a chance to grab me. I put my arm behind me to loosen my pistol. "Don't you know you can't touch an officer?" The other one grabbed me from behind and pulled my arm up so that it twisted in the socket. I turned with him and the other one grabbed me around the neck. I kicked his shins and got my left knee into his groin. "Shoot him if he resists," I heard some one say. "What's the meaning of this?" I tried to shout but my voice was not very loud. They had me at the side of the road now. "Shoot him if he resists," an officer said. "Take him over back." "Battle police," another officer said. "Why don't you ask me to step over instead of having one of these airplanes grab me?" They did not answer. They did not have to answer. They were battle police. "Take him back there with the others," the first officer said. "You see. He speaks Italian with an accent." "So do you, you ," I said. "Take him back with the others," the first officer said. They took me down behind the line of officers below the road toward a group of people in a field by the river bank. As we walked toward them shots were fired. I saw flashes of the rifles and heard the reports. We came up to the group. There were four officers standing together, with a man in front of them with a carabiniere on each side of him. A group of men were standing guarded by carabinieri. Four other carabinieri stood near the questioning officers, leaning on their carbines. They were wide-hatted carabinieri. The two who had me shoved me in with the group waiting to be questioned. I looked at the man the officers were questioning. He was the fat gray-haired little lieutenant-colonel they had taken out of the column. The questioners had all the efficiency, coldness and command of themselves of Italians who are firing and are not being fired on. "Why are you not with your regiment?" "Do you not know that an officer should be with his troops?" That was all. Another officer spoke. "It is you and such as you that have let the barbarians onto the sacred soil of the fatherland." "I beg your pardon," said the lieutenant-colonel. "It is because of treachery such as yours that we have lost the fruits of victory." "Have you ever been in a retreat?" the lieutenant-colonel asked. We stood there in the rain and listened to this. We were facing the officers and the prisoner stood in front and a little to one side of us. "If you are going to shoot me," the lieutenant-colonel said, "please shoot me at once without further questioning. The questioning is stupid." He made the sign of the cross. The officers spoke together. One wrote something on a pad of paper. "Abandoned his troops, ordered to be shot," he said. Two carabinieri took the lieutenant-colonel to the river bank. He walked in the rain, an old man with his hat off, a carabiniere on either side. I did not watch them shoot him but I heard the shots. They were questioning some one else. This officer too was separated from his troops. He was not allowed to make an explanation. He cried when they read the sentence from the pad of paper, and they were questioning another when they shot him. They made a point of being intent on questioning the next man while the man who had been questioned before was being shot. In this way there was obviously nothing they could do about it. I did not know whether I should wait to be questioned or make a break now. I was obviously a German in Italian uniform. I saw how their minds worked; if they had minds and if they worked. They were all young men and they were saving their country. The second army was being re-formed beyond the Tagliamento. They were executing officers of the rank of major and above who were separated from their troops. They were also dealing summarily with German agitators in Italian uniform. They wore steel helmets. Only two of us had steel helmets. Some of the carabinieri had them. The other carabinieri wore the wide hat. Airplanes we called them. We stood in the rain and were taken out one at a time to be questioned and shot. So far they had shot every one they had questioned. The questioners had that beautiful detachment and devotion to stern justice of men dealing in death without being in any danger of it. They were questioning a full colonel of a line regiment. Three more officers had just been put in with us. I looked at the carabinieri. They were looking at the newcomers. The others were looking at the colonel. I ducked down, pushed between two men, and ran for the river, my head down. I tripped at the edge and went in with a splash. The water was very cold and I stayed under as long as I could. I could feel the current swirl me and I stayed under until I thought I could never come up. The minute I came up I took a breath and went down again. It was easy to stay under with so much clothing and my boots. When I came up the second time I saw a piece of timber ahead of me and reached it and held on with one hand. I kept my head behind it and did not even look over it. I did not want to see the bank. There were shots when I ran and shots when I came up the first time. I heard them when I was almost above water. There were no shots now. The piece of timber swung in the current and I held it with one hand. I looked at the bank. It seemed to be going by very fast. There was much wood in the stream. The water was very cold. We passed the brush of an island above the water. I held onto the timber with both hands and let it take me along. The shore was out of sight now. It was hot walking through the town but the sun was starting to go down and it was very pleasant. The British hospital was a big villa built by Germans before the war. Miss Barkley was in the garden. Another nurse was with her. We saw their white uniforms through the trees and walked toward them. Rinaldi saluted. I saluted too but more moderately. "How do you do?" Miss Barkley said. " You' re not an Italian, are you?" Rinaldi was talking with the other nurse. They were laughing. "What an odd thing — to be in the Italian army." "It's not really the army. It's only the ambulance." "It's very odd though. Why did you do it?" "I don't know," I said. "There isn't always an explanation for everything." "Oh, isn't there? I was brought up to think there was." "Do we have to go on and talk this way?" "That's a relief. Isn't it?" "What is the stick?" I asked. Miss Barkley was quite tall. 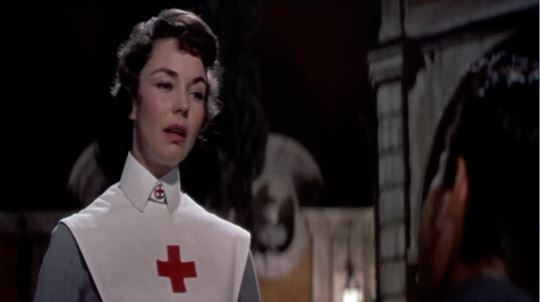 She wore what seemed to me to be a nurse's uniform, was blonde and had a tawny skin and gray eyes. I thought she was very beautiful. She was carrying a thin rattan stick like a toy riding-crop, bound in leather. "It belonged to a boy who was killed last year." "He was a very nice boy. He was going to marry me and he was killed in the Somme." "It was a ghastly show." "I've heard about it," she said. "There's not really any war of that sort down here. They sent me the little stick. His mother sent it to me. They returned it with his things." "Had you been engaged long?" "Eight years. We grew up together." "And why didn't you marry?" would be bad for him." We sat down on a bench and I looked at her. "You have beautiful hair," I said. "I was going to cut it all off when he died." "I wanted to do something for him. You see I didn't care about the other thing and he could have had it all. He could have had anything he wanted if I would have known. I would have married him or anything. I know all about it now. But then he wanted to go to war and I didn't know." "I didn't know about anything then. I thought it would be worse for him. I thought perhaps he couldn't stand it and then of course he was killed and that was the end of it." "Oh, yes," she said. "That's the end of it." We looked at Rinaldi talking with the other nurse. "Ferguson. Helen Ferguson. Your friend is a doctor, isn't he?" "That's splendid. You rarely find any one any good this close to the front. This is close to the front, isn't it?" "It's a silly front," she said. "But it's very beautiful. Are they going to have an offensive?" "Then we'll have to work. There's no work now." "Have you done nursing long?" "Since the end of 'fifteen. I started when he did. I remember having a silly idea he might come to the hospital where I was. With a sabre cut, I suppose, and a bandage around his head. Or shot through the shoulder. Something picturesque." "This is the picturesque front," I said. "Yes," she said. "People can't realize what France is like. If they did, it couldn't all go on. He didn't have a sabre cut. They blew him all to bits." "Do you suppose it will always go on?" "We'll crack. We'll crack in France. They can't go on doing things like the Somme and not crack." In the late summer of that year we lived in a house in a village that looked across the river and the plain to the mountains. In the bed of the river there were pebbles and boulders, dry and white in the sun, and the water was clear and swiftly moving and blue in the channels. Troops went by the house and down the road and the dust they raised powdered the leaves of the trees. The trunks of the trees too were dusty and the leaves fell early that year and we saw the troops marching along the road and the dust rising and leaves, stirred  by the breeze, falling and the soldiers marching and afterward the road bare and white except for the leaves. 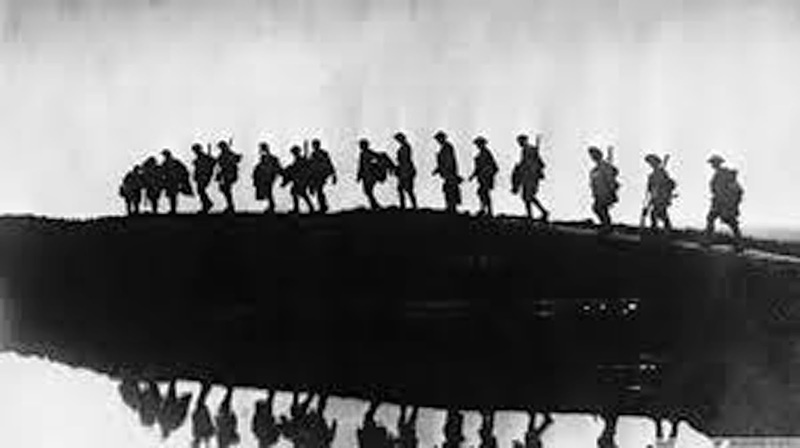 Sometimes in the dark we heard the troops marching under the window and guns going past pulled by motor-tractors. 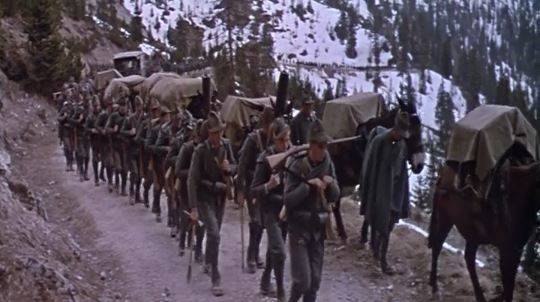 There was much traffic at night and many mules on the roads with boxes of ammunition on each side of their pack-saddles and gray motor-trucks that carried men, and other trucks with loads covered with canvas that moved slower in the traffic. There were big guns too that passed in the day drawn by tractors, the long barrels of the guns covered with green branches and green leafy branches and vines laid over the tractors. To the north we could look across a valley and see a forest of chestnut trees and behind it another mountain on this side of the river. There was fighting for that mountain too, but it was not successful, and in the fall when the rains came the leaves all fell from the chestnut trees and the branches were bare and the trunks black with rain. The vineyards were thin and bare-branched too and all the country wet and brown and dead with the autumn. There were mists over the river and clouds on the mountain and the trucks splashed mud on the road and the troops were muddy and wet in their capes; their rifles were wet and under their capes the two leather cartridge-boxes on the front of the belts, gray leather boxes heavy with the packs of clips of thin, long 6.5 mm. cartridges, bulged forward under the capes so that the men, passing on the road, marched as though they were six months gone with child. There were small gray motor-cars that passed going very fast; usually there was an officer on the seat with the driver and more officers in the back seat. They splashed more mud than the camions even and if one of the officers in the back was very small and sitting between two generals, he himself so small that you could not see his face but only the top of his cap and his narrow back, and if the car went especially fast it was probably the King. He lived in Udine and came out in this way nearly every day to see how things were going, and things went very badly. At the start of the winter came the permanent rain and with the rain came the cholera. But it was checked and in the end only seven thousand died of it in the army. Is this magic or real? KindleUnlimited might be beneficial for many readers. 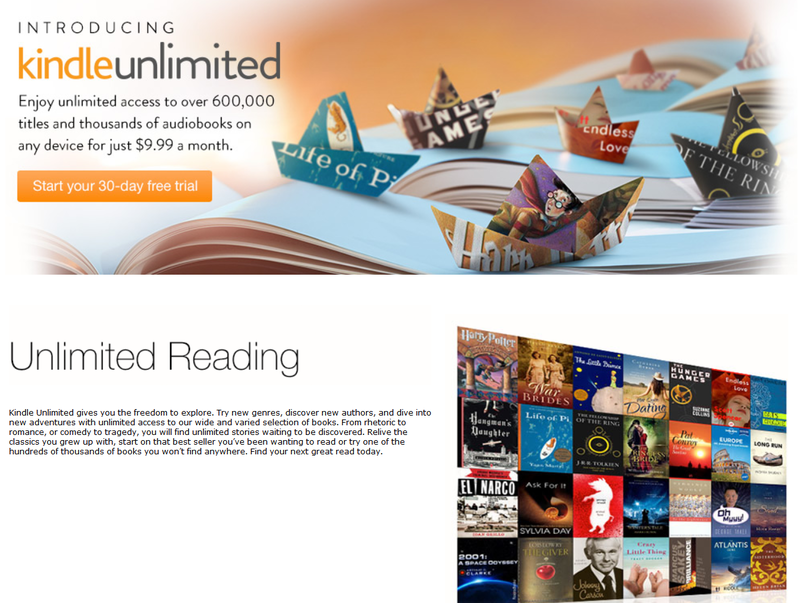 At $9.99 a month, you can read unlimited number of books. A 30-day free trial gives you a good option to taste it.